Adding templates to Google Slides. The Athletics Department online presence. I remember my first collection of bookmarks, back when they were called Favorites in Internet Explorer. Each new site found its way to a folder and each folder had an inspirational name: Photography, Recipes, Knowledge, etc. The list grew large, unruly, unvisited, disorganized, full of duplicates, links that no longer worked, and outdated information until I lost it all, every single bookmark vanished in a crash-slash-reformat accident. I started with a clean slate and the truth was that I had just a dim recollection of each favorite. I really did not miss any. Today, thanks to a newer generation of smarter browsers, I use bookmarks as triggers for suggestions from the address bar in a very different, time saving fashion. Always See the Bookmarks Bar: The bookmarks bar is located just under the address bar. It gives you quick access to bookmarks in the form of buttons you click to visit the sites they point to. By default the bookmarks bar is hidden in most browsers. Make sure you always see it by checking the View menu of your browser and selecting Always Show the Bookmarks Bar. These are great shortcuts. I keep a list of my primary sites on the Bookmarks Bar: Google Mail, Google, our school website. Sometimes I also use folders from the Bookmarks Bar to keep a longer list of website URLs structured. Have you ever googled Google because you were too lazy to type “.com” in the address bar to form a complete URL? Here is the most important feature of bookmarks in Chrome, Firefox and even Safari: when you bookmark a website, the site name becomes a suggestion available from the address bar in your browser. Bookmark www.ilovepickles.org and the next time you type a string of keys pertaining to the URL or the name of the site (e.g. : “pic” from “pickles“), the smart address bar will suggest your bookmark first. This is the most important feature available with bookmarks nowadays and it is the ultimate time saving tool. Of course this is extremely useful for websites with very complicated URLs, but it works so well, I end up bookmarking all my most frequented websites. Read about my tips on bookmarking Google Docs and upgrading your Bookmarks Manager in the full article of Bookmark Sites for Speed. WHY? Google Slides is a great way to create and share collaborative presentations. The default themes in Slides are serviceable, but there are times when something different is in order — especially if you find yourself using the same theme over and over. And chances are if you are bored with seeing the same theme over and over, your audience is probably bored with seeing it as well. WHAT? 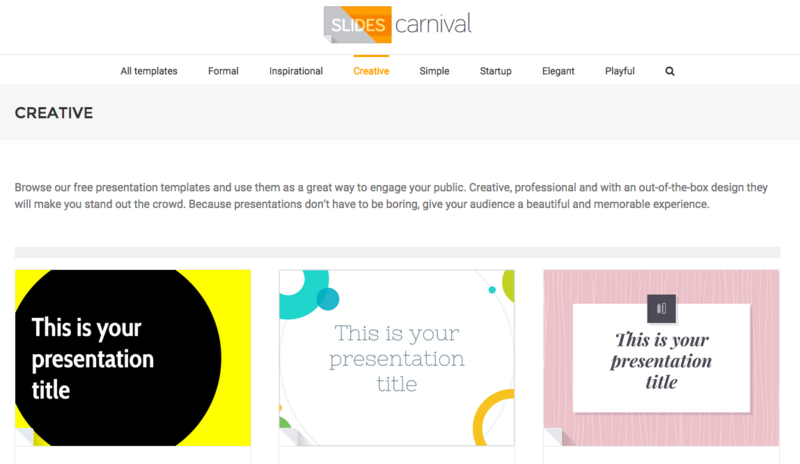 Slides Carnival is a website that allows you to download free themes to use in your own presentations. It also works with PowerPoint. As with Google Slides, slidescarnival.com themes are able to be exported as a PDFs, as well as other image formats. HOW? The Slides Carnival FAQ is very easy to understand. Slides Carnival was brought to my attention by Jeff Plaman, @jplaman, a Digital Literacy Coach in Singapore at UWCSEA through Twitter. Try out Twitter for daily PD. With inspiring initiative, Ken Su has developed an incredibly useful website for KAS Athletics Department. His website built on Google Sites is a goldmine of information on the Athletics, Extra-Curricular, et Performing Arts activities taking place in the school. It is very encouraging to see what can happen when you mix technology into sports. Angel Huang is also using the platform to share a wealth of documents pertaining to the Creativity Action Service program, and most recently the Manga Anime Club website was developed by its president, Julian. Well done! Did we leave something out? Open the newsletter in your browser and leave a comment to let me know.